Brelynn will be receiving a bone marrow transplant February or March of 2019. We have one highly probable living donor. He is a young male, but we can't contact him and proceed with further testing until insurance approves Duke to do the transplant. If he is determined not to match, we will then go with an unmatched cord blood donor. Brelynn suffers from a form of Combined Variable Immune Deficiency specifically called IKAROS. It is a gene defect. It causes her to make no B cells and only partial T cells function. This leaves her open to lots of infection. Brelynn was a little over two-years old the first time she was in public. Over the years, we have tried to make her life more normal taking her to dinner, allowing her to play at the park, even taking her to the movies for a special evening. As time goes on, Brelynn has proven she is more sickly. Based off the limited knowledge they do have, it is apparent Brelynn will only get sicker from here. It is best to do the transplant now, while she is considered well with minimal organ damage. Over time the pneumonia's she has had yearly, as well as various infections will eventually take their toll. To date the researchers have discovered 13 patients with this gene mutation. 3 children have had transplants of the 13, one passed and 2 are living. If we can find a close match Brelynn's chance of successful outcome is about 80%. This would completely cure her and revamp her immune system. She would no longer have weekly infusions, Pentamidine treatments, etc. She could go to school, be in public just like normal children. There are medications she would have to take and still see doctors to confirm everything is working like it should. There are lists of complications that I don't want to talk about unless they happen. Some minor and some causing organ failure and fatality. Our plan at this time is to move to Duke 3 weeks prior to transplant for chemo. She will have extensive treatments to completely wipe out her immune system that she does have. Once there we will be in the hospital for 2 months give or take. I have a list of 10 of the closest family members and they are the only ones that will be allowed to visit Brelynn while in the hospital. It is very important that she not get sick while the cells are grafting. After the 2 months in the hospital, we will move to the house with Scotty, Bryson and Granny for at the least 4 months. If she gets sick at any time of course the stays for all of this will change. We were told to be prepared for 6 months to a year in NC. The doctors asked that I have at least 1 to 2 people with me at all times during this because Brelynn can never be left alone in the hospital room, for support and caring for her round the clock. I will need breaks as well even though I will be staying at the hospital with her. Ronald McDonald does not provide living arrangements for more than 2 people in the family. They can only accommodate one bedroom and obviously we cannot all stay there. I was told that the transplant team does own a home, but as of right now they have a family staying there. I have been looking at homes for rent in the area and on average they are $850-$1300 per month. Meanwhile, we have to pay our bills here, house payment, etc. and will have to live there (rent, lights, food, insurance, etc). I'm starting the fundraising now so when the time comes we hope to not have to worry about bills while being with our daughter for the fight for her life. I have been granted a one-year leave of absence from work. My husband, Scotty will be taking the 6 months off to go to Duke with us. We initially tried to get a transfer, but her doctors decided that was not the best decision because he works in the public and that would bring germs into the hospital/home to Brelynn that could make her very sick or potentially kill her. We will still have to pay his job for our normal expenditures, health insurance, retirement, etc during this time. Also, we were informed once insurance approves, they will debate with Duke Children's Hospital on how much they are willing to pay. Example: Insurance agrees to pay 80,000 and the hospital charges 100,000 we will be responsible for paying the 20,000 up front for her transplant. To the ones that want to contribute, we have set a goal of 30,000. If we exceed that amount any money not spent at Duke will be put in an account for Brelynn later in life or whenever she needs it. Please above all keep us in constant prayer and any contribution is greatly appreciated. This Thursday, 1/31/19 Brelynn has an appointment with Children's Cancer and Blood Disorder Center here in Columbia. She has been referred as a group effort from her doctors at Duke since her neutrophils have not recovered and continued to stay low. They are concerned, as in the past they recovered without medication. With Brelynn's deficiency, in the past I have reiterated that B cell leukemia is a real concern, as the other patients with her illness have developed this type of cancer. At this appointment we will be setting up "another" bone marrow biopsy and aspiration to be performed asap. They will be looking for changes in her marrow. 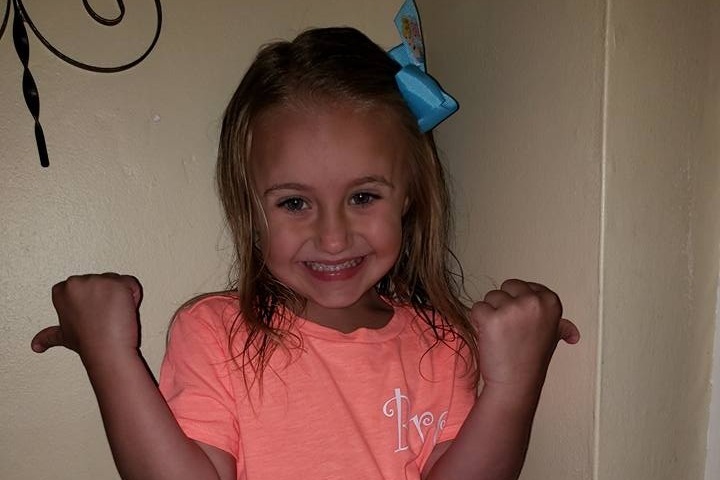 After speaking with Brelynn's team of doctors they decided to hold off on the GSF medication for the time being unless she gets sick or until we can gather further information as to what is going on in her marrow at this time. We are still waiting on insurance approval before we have the transplant date. Brelynn's neutrophils still have not recovered and for the third week in a row they are 400. Since, we are anticipating the bone marrow transplant the team of doctors decided against the GCF treatment unless she gets sick for the moment. They are concerned about the neutrophils/bone marrow b/c they are lowest they've ever been without recovering to her normal 600-900. Therefore, we will be seeing hematology in Columbia for a bone marrow biopsy and aspiration asap. They want to see what has changed and make sure nothing is wrong in the bone marrow. Please PRAY that there is nothing wrong and that this is just part of the immune defect she has. THERE HAVE BEEN NO CHANGES WITH INSURANCE AND BRELYNN WAS NOT DENIED BY INSURANCE FOR HER TRANSPLANT. Sorry for any confusion that previous posts may have caused. We are still fighting the fungal infection on her hands and feet. Some days it looks better, other days it hurts. Please take 2 minutes and send some thoughts up to the big guy today. Love you all! Thanks for your support. We are awaiting an update from Brelynn's transplant coordinator regarding insurance approval/denial. I spoke to her immunologist here in Columbia that said we should have heard something by now, to the best of her knowledge. She was going to touch base with the team of doctors to see where things were. Secondly, the doctors are in agreement that Brelynn see a hematologist here to start the GSF injections for neutropenia. =( Of course I'm not happy with that decision, but I don't have a choice, as her neutrophils being this low can leave her susceptible to some pretty nasty things. I asked if we could have insurance expedite the request for transplant so we could put off yet another, injection/medication for her. I'm still waiting for a response. Hopefully, I will know more tomorrow. Also, transplant team have requested all labs from the last couple of weeks to look at other numbers on CBC to decide on bone marrow biopsy and aspiration again. Definitely not what we wanted. Her doctor called today and we are going back Thursday for blood work and if this one is low she will have to be placed on the GSF medication we all dreaded. This will be a weekly injection from hematology in Columbia. Phoey!! How much more can one little girl take?! Treatment, injections, infusions, inhaled antibiotics. Have you ever heard anyone say they look forward to transplant? I can't wait to have my daughter healed. This journey keeps getting harder and harder. PLEASE START PRAYING THAT THURSDAY HER NEUTROPHILS COME BACK UP AND STAY UP UNTIL TRANSPLANT. She does not need anything else going on right now. Her anxiety is through the roof and it's effecting her sleeping. She stayed up until 5am Monday morning, which is making her want to sleep until midday.